A catalog for Mrs. Prindable's handmade confections came to my house recently, and of course, I found inspiration inside. The goodies themselves look yummy, too! I used a new embossing folder by Sizzix called Powdered Sugar which has vertical rows of flowers, dots and diamonds. I thought it would echo the vertical stack of presents. And the presents....I made them by using 1", 1 1/4" and 1 3/8" square punches on retired flocked SU paper. They have scalloped "lids", using a scallop border punch and white cardstock. Each gift is propped up on dimensionals, and a metallic thread ties them all up together (each thread end is taped onto the backs of the smallest and largest gifts). I also tied a bow separately near the top. I believe my Creativity just walked back in the door. Colleen, this is stunning! I love that it's packed with little details yet so simple. Umm can you say Gorgeous???? Girl you rocked the colors on this challenge and I love your card to pieces! YOU ROCK! Too cute :) Love the stacked pressies. Wow, Colleen! Isn't it amazing where we find inspiration? Just an all around lovely card, fabulous in detail, colors and design! I just love when you come play with us at the Play Date Cafe! Yes, I do believe that your Creativity came home again to roost!! Colleen, this is FANTASTIC!! Oh, my goodness. I just don't know what else to say!! Love, love, love your inspiration. That stack of gifts is so simple but SO effective. This is the PERFECT CAS card and so lovely for Christmas. This is a slam dunk!!!!!! I am predicting a new badge for your blog for this one. Fabulous card, so clean and Christmassy! I love your inspiration! What a great card! 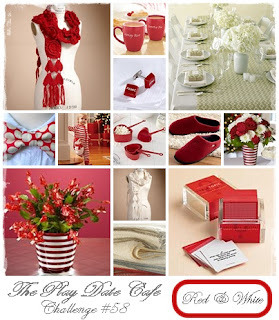 We can find inspiration in so many places, I love yours featured here, it's fab! Thanks for playing along with us at the Play Date Cafe this week! I LoVe Mrs Prindables and I LoVe this card! Oh this is lovely Colleen! Great use of that fantastic inspiration photo...lovely embossing folder too! See?? I TOLD you there would be a new badge on your blog for this one!! Of course, there are still challenges to weigh in yet, so who knows--this could be a double or triple winner! CONGRATULATIONS, Colleen, on your PDCC win!! Very cute and creative take on the picture. I like the red and white, very festive. Perfection! LOVE everything about it! Heavens, Colleen! I'm really enjoying your inspired stamping! I'm thinking how this might be fun to mass produce. What a creative mind you have to think it up. I love the scalloped lids!